Without cool prizes and lots of sugar, why should kids eat cereal? First they took out the toys, now they're cutting way back on the sugar. Soon, all kids will hate cereal. General Mills, maker of such decadent desserts, er, breakfast foods, as Cookie Crisp and Reese's Puffs, is dialing down the sugar in some of its best selling cereals, reported the Minneapolis Star-Tribune. It's the third time in as many years that General Mills has pledged to lower the amount of sugar in its cereals. The Minnesota-based company says all 10 of its cereals marketed to children younger than 12 will eventually have less than 10 grams of sugar per serving. That works out to as much as a 30% sugar reduction for some brands. "We've listened to our consumers, and some would prefer to see even lower levels of sugar, especially in children's cereals," said Kirstie Foster, a company spokeswoman. General Mills announced in 2007 that it would cut sugar in children's cereals to 12 grams or less, a goal that was met last year. Then the new goal became 11 grams. That goal will be met by the end of this month, said Foster. Brands that will have lower sugar content include Cocoa Puffs, Cinnamon Toast Crunch, Cookie Crisp, Cookie Crisp Sprinkles, Frosted Cheerios, Honey Nut Cheerios, Lucky Charms, Reese's Puffs and Trix. Exempt from the sugar pullback are Chocolate Lucky Charms, Boo Berry and Franken Berry, which have 12 grams of sugar per serving but aren't advertised. Kids may hate the move, but critics applauded. 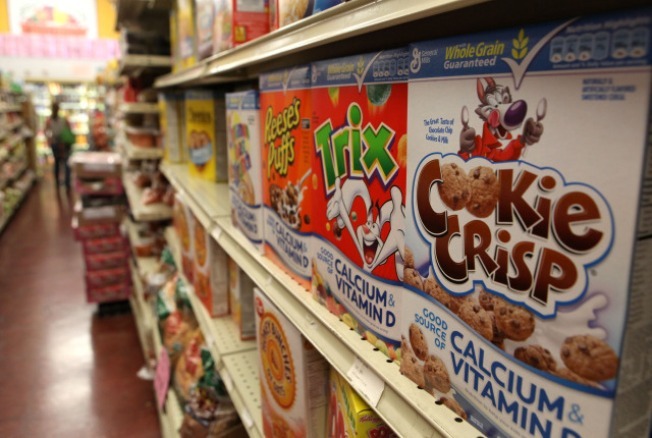 "As sugary cereal is one of the top products marketed to children, we hope the company swiftly implements these changes and that Kellogg, Post Foods and other competitors quickly follow General Mills' lead," read a statement from the Center for Science in the Public Interest, a nonprofit based in Washington, D.C., that over the years has fought for less sugar in children's cereals.